RP-500 ½- 1. Modification Overview Production of the RP500 began in 2007 and is current. Production of the RP500 began in 2007 and is current. 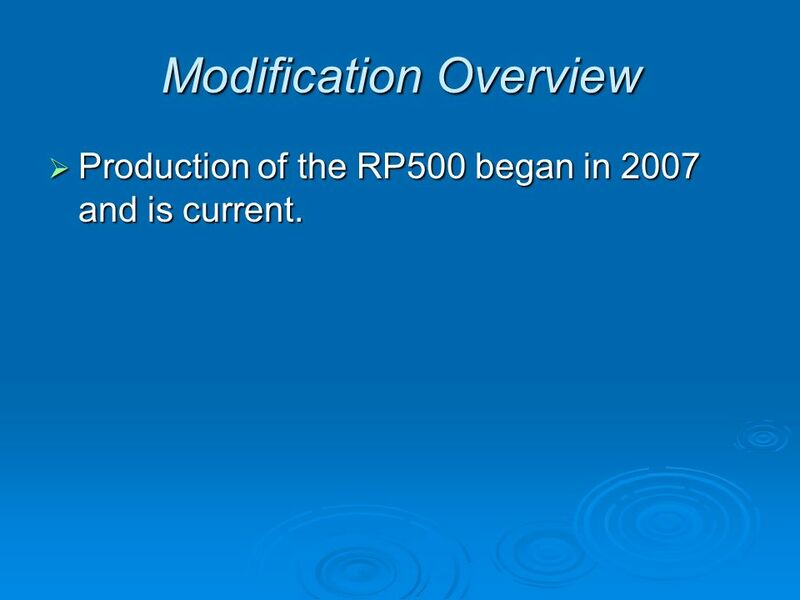 2 Modification Overview Production of the RP500 began in 2007 and is current. Production of the RP500 began in 2007 and is current. 3 Single Access Cover Removal The cover is spring loaded and sealed by the diaphragm. 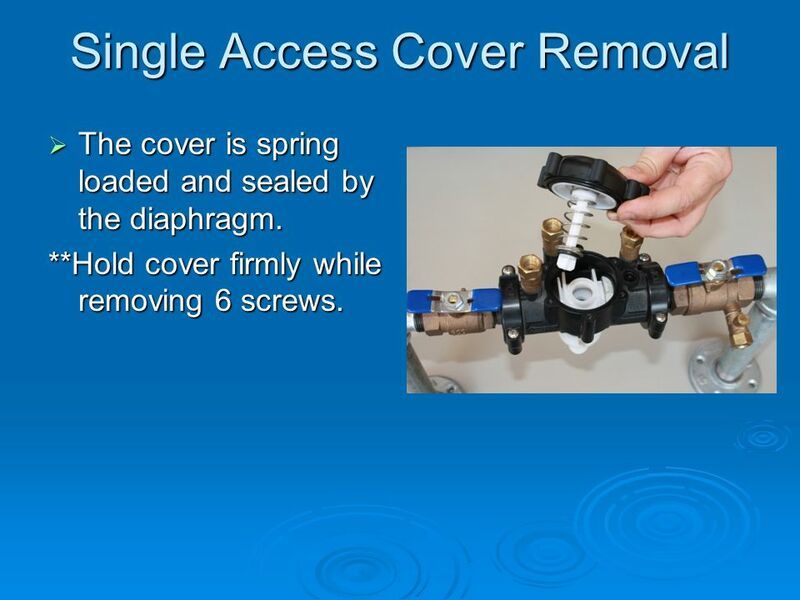 The cover is spring loaded and sealed by the diaphragm. **Hold cover firmly while removing 6 screws. 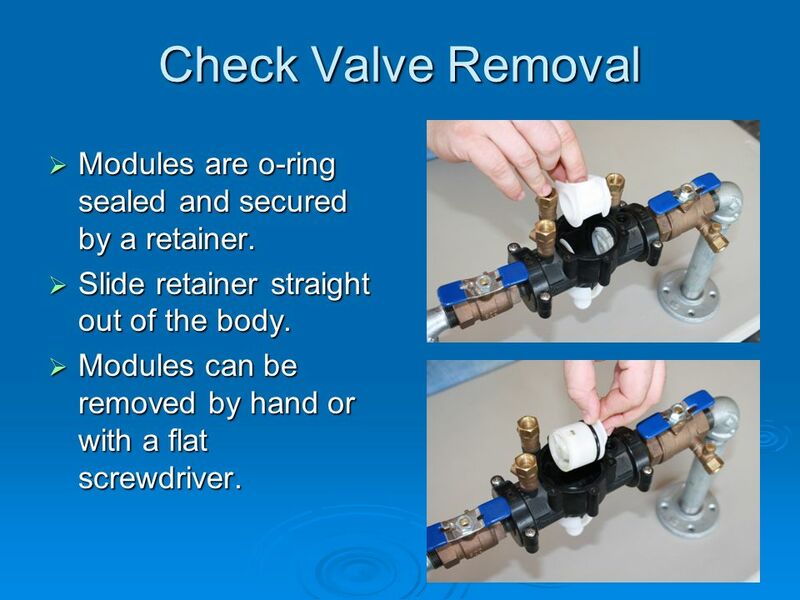 4 Check Valve Removal Modules are o-ring sealed and secured by a retainer. Modules are o-ring sealed and secured by a retainer. Slide retainer straight out of the body. Slide retainer straight out of the body. Modules can be removed by hand or with a flat screwdriver. Modules can be removed by hand or with a flat screwdriver. 5 Disassemble Check Valve The check modules are not designed to be disassembled. 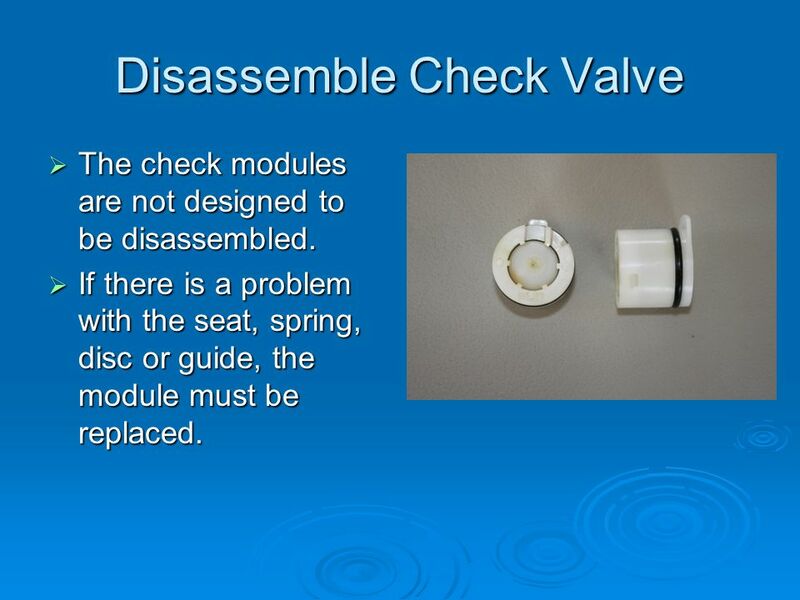 The check modules are not designed to be disassembled. If there is a problem with the seat, spring, disc or guide, the module must be replaced. If there is a problem with the seat, spring, disc or guide, the module must be replaced. 6 Check Valve Reassembly Notes Reassemble in reverse order. Reassemble in reverse order. Apply lubricant to o-rings. Apply lubricant to o-rings. 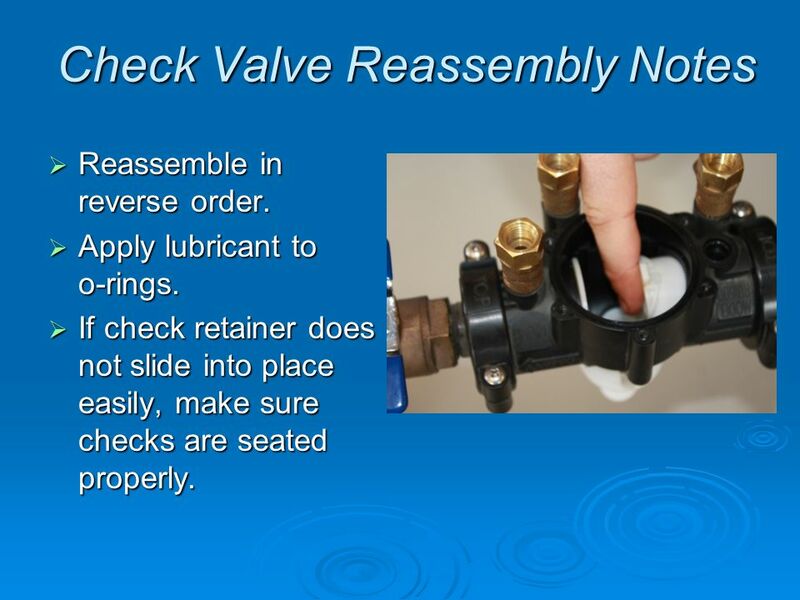 If check retainer does not slide into place easily, make sure checks are seated properly. If check retainer does not slide into place easily, make sure checks are seated properly. 7 RV Stem Removal The RV stem and spring are situated between the check valves and are free once the single access cover is removed. 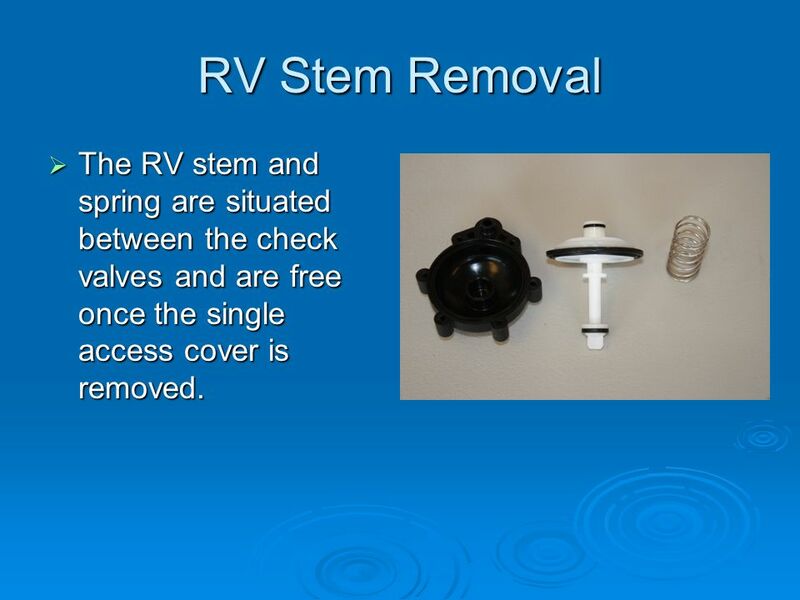 The RV stem and spring are situated between the check valves and are free once the single access cover is removed. 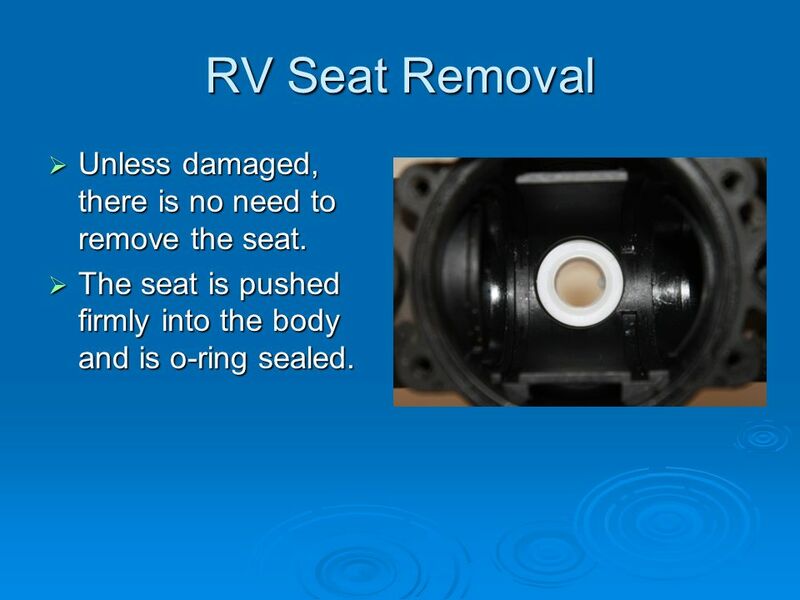 8 RV Seat Removal Unless damaged, there is no need to remove the seat. Unless damaged, there is no need to remove the seat. The seat is pushed firmly into the body and is o-ring sealed. The seat is pushed firmly into the body and is o-ring sealed. 9 RV Stem Disassembly Remove the screw at the top of the stem. Remove the screw at the top of the stem. Remove the upper plate, diaphragm and lower plate. Remove the upper plate, diaphragm and lower plate. ** An o-ring is located under the bottom plate on the stem. 10 RV Stem Disassembly The RV disc is on the lower stem and held in place by the stem fin guide. The RV disc is on the lower stem and held in place by the stem fin guide. ** The stem fin guide is not removable. 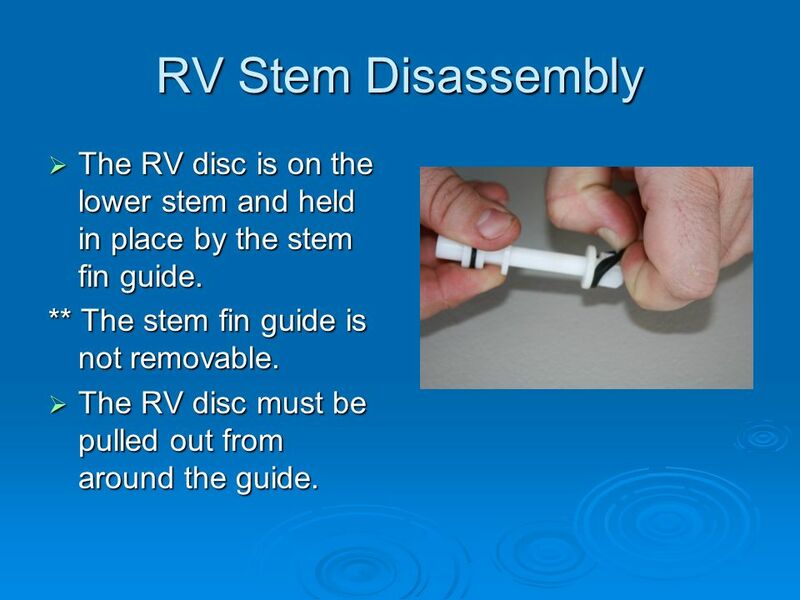 The RV disc must be pulled out from around the guide. The RV disc must be pulled out from around the guide. 11 RV Stem Reassembly Make sure ridge on diaphragm is facing down. Make sure ridge on diaphragm is facing down. Lubricate the upper stem o-ring. Lubricate the upper stem o-ring. 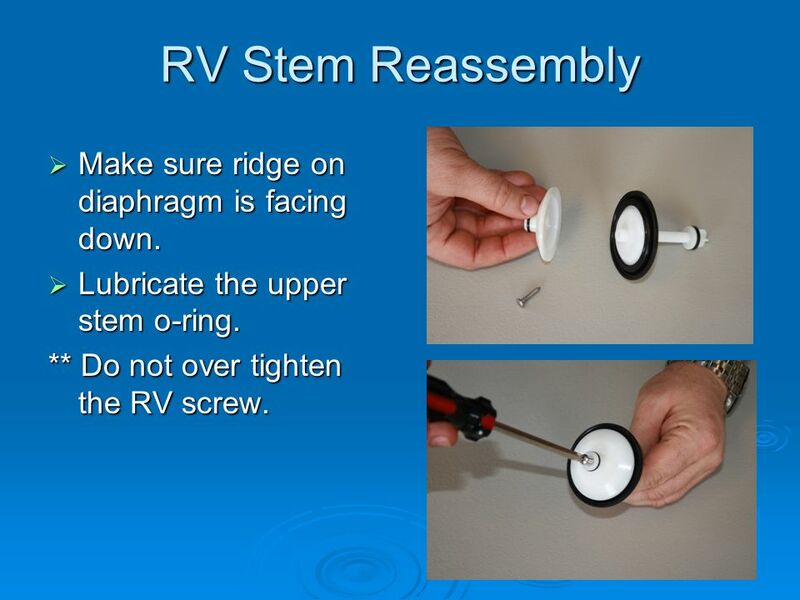 ** Do not over tighten the RV screw. 12 Reassembly Notes Make sure sensing line o-ring is in place. Make sure sensing line o-ring is in place. 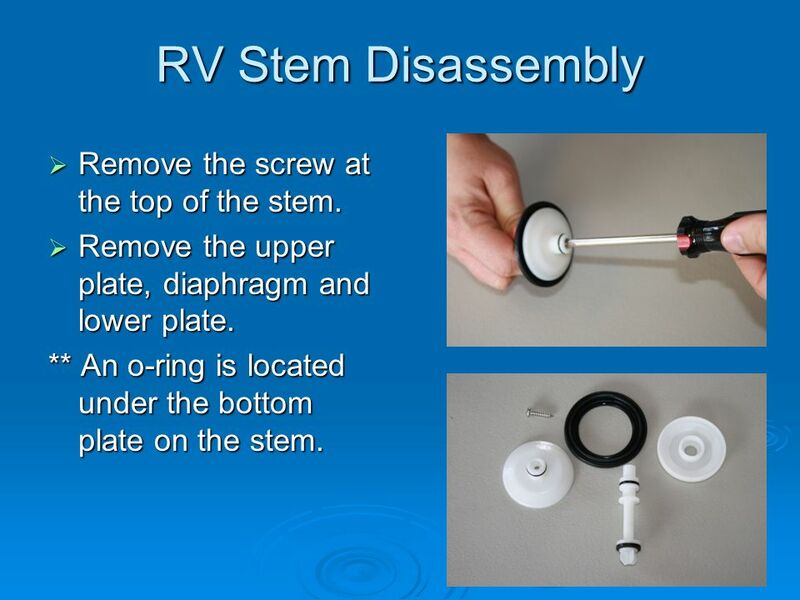 The RV stem will insert through the hole of the retainer and the spring will rest on top of the the retainer. 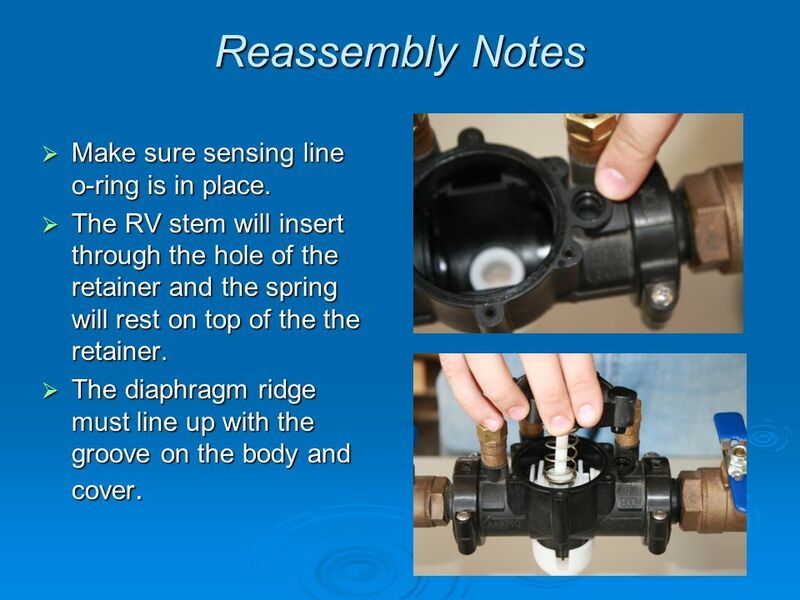 The RV stem will insert through the hole of the retainer and the spring will rest on top of the the retainer. The diaphragm ridge must line up with the groove on the body and cover. The diaphragm ridge must line up with the groove on the body and cover. Download ppt "RP-500 ½- 1. Modification Overview Production of the RP500 began in 2007 and is current. Production of the RP500 began in 2007 and is current." 350, 350XL 1¼ - 2. Modification Overview Production of the 1¼ began in 2004 and is current. Production of the 1¼ began in 2004 and is current. RP4AN 21/2 – 6. Modification Overview Production of the RP4AN series began in Production of the RP4AN series began in The 4AN indicates an. 1. Install Your BalJak™ into floor using driver and drill. Clutch Replacement & Inspection Be sure to mark the Pressure Plate to Flywheel orientation. Loosen bolts in sequence 1/2 turn at a time to prevent warpage. Engine Service. Cylinder heads ä ä 1. Clean ä ä 2. Check for Cracks inspect exhaust port and in between valves ä ä 3. Check for Warpage ä ä 4. Inspect. MER/SUP 1 DOOR EVAPERATOR DRAIN PAN REPLACEMENT 1. Remove the (4) screws that secure the evaporator coil, using a 5/16” socket. 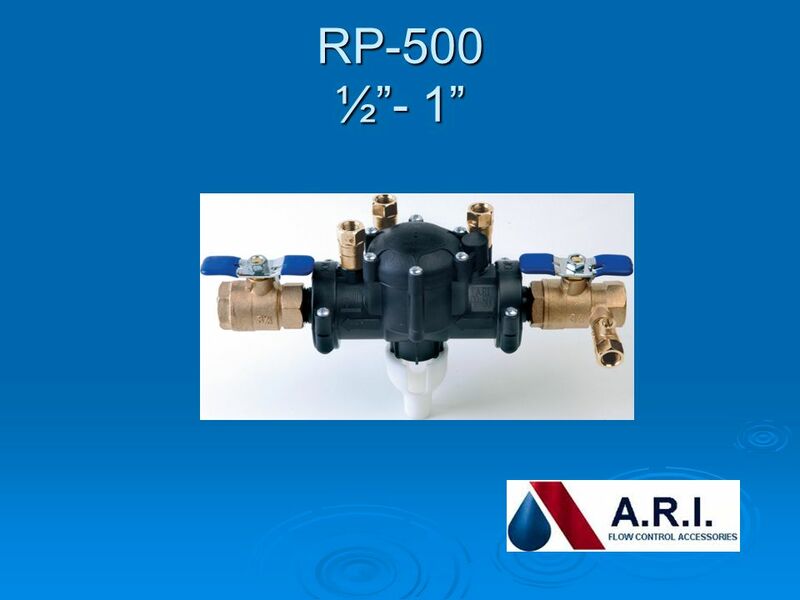 3” BACKWASH VALVE WITH SUPERSTAR ACTUATOR BASIC SERVICE MANUAL Does not apply to PLC-MP version SUPERSTARS. ¾”-2”. Modification Overview  Production of the series began in 1989 and is current.  Early models of ¾”-2” series did not always. Leg Assembly A step-by step guide to the disassembly and service of a HUBO leg. RPDA 4A 2½” – 6”. Modification Overview  Production of the RPDA 4A series began in  The RPDA 4A can utilize either a Type I or Type II bypass. Blackwood Fire Company Stihl Chainsaw Maintenance. 860 21/2”-10”. Modification Overview  Production of the 2½” – 10 sizes began in  Lead free version (LF860) was introduced in Parts do not. L2000 Technical Training 6. Assemble/Disassemble. How to Change Raptor Knife Blades. Step 1: Use a Phillips screwdriver to remove the 5 screws. It is not necessary to remove the lanyard/webbing to change.